Private rear sited bach, cross the road to access beautiful Waihi Beach on popular Broadway Road. Tidy and clean. Comfortably sleeps 7. Quiet and private due to rear situation, and off the road when busy in peak season. We welcome families to enjoy our bach as we do. Basic Sky TV and DVD player for watching movies. Walk 1 block to a fully equipt dairy and during the Summer months a Fish and Chip takeaways. Walk to the beach with your buckets and spades, umbrella and other necessities, access across the road. The beach is great for swimming, surfing, fishing or a lovely stroll and collecting shells with the kids. Short drive to cafe's, shops and restaurants, hotel and RSA and Hot Pools. 15 minutes to the both the towns of KatiKati and Waihi. Photos of the beach not taken from the property but from the beach accessway across the road. Our family bach at times will be undergoing improvement renovation. We will tell you if this will affect your stay at the time of booking. Stating simply as photos at the time of booking may differ after renovation. Bond required, refundable after inspection. Families preferred - not a party pad for New Years. Smokers allowed outside only. No Pets. Great spot for a family holiday! Perfect for kids. Owners were very accommodating and friendly. Fantastic location-cross the road to the beach. Fabulous location, very close to the beach and a dairy. 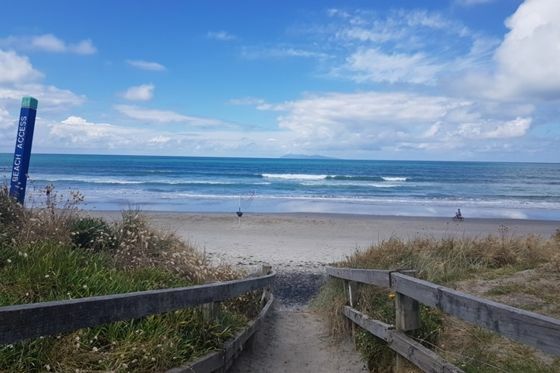 Fabulous location, very close to the beach and a dairy. A traditional kiwi bach with comfortable amenities. We had a wonderful holiday.